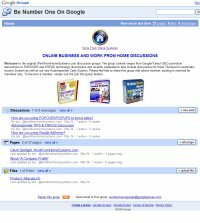 The “Be Number One On Google” group is the trademark discussion for WorkFromHomeSystems.com. This Google Powered group is the home base and community tool that is used by all the WorkFromHomeSystem clients that choose to particapate. Already, over 1,000 users have registered and we share online marketing ideas, tips, and tricks in an open forum. There is absolutely no charge for the use of the forum, but membership is reserved for clients and friends of WorkFromHomeSystems. Site content is rich and deep, we offer a series of White Papers on important internet marketing as well as over a dozen important topics whre you can post questions, reply, and exchange ideas and thoughts on Internet marketing. The group has proven to be a powerful tool for both clients and staff at WorkFromHomeSystems. Providing a common platform and interface, the group makes it easy for all to communicate directly and efficiently. Our clients love it for a variety of reasons, however one of the most common remarks we get is that it provides a medium to exchange thoughts and ideas with like minded online marketeers.